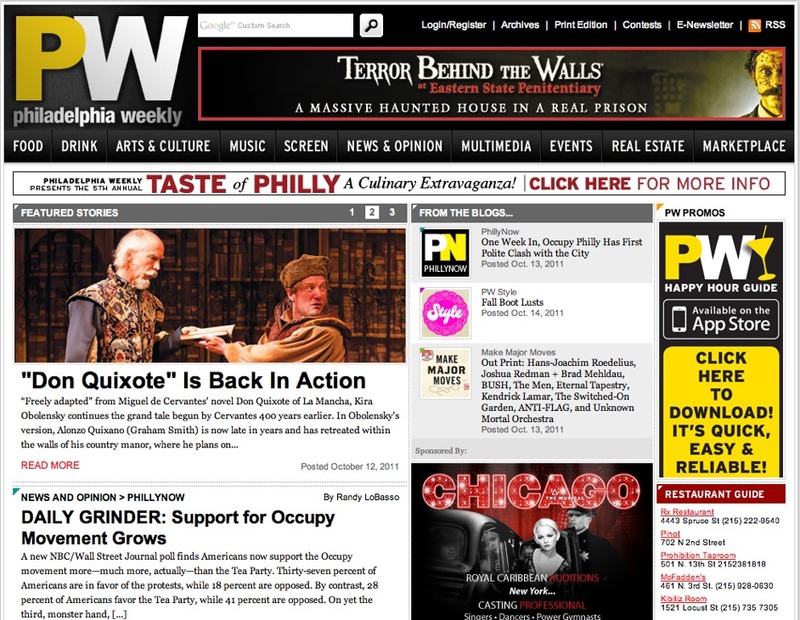 The Philadelphia Weekly is published by Review Publishing Limited Partnership. It is a weekly “alternative news” publication featuring “politics, alternative news, music, restaurant reviews, art, real estate, classifieds” and more. The weekly publication was established in 1971 and publishes every Wednesday. They have a circulation of 107,203 and are distributed in Philadelphia, Delaware, Montgomery and Chester Counties, in Pennsylvania. 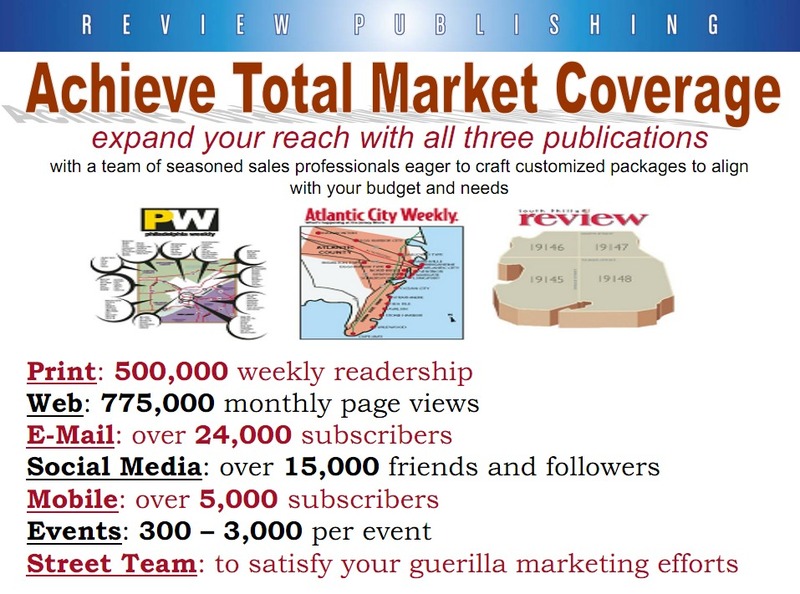 The Review Publishing Limited Partnership also publishes the Atlantic City Weekly, and The South Philly Review. The website is quite busy. The “top fold” of the website features their logo alongside banner advertising. The page is cluttered with advertising from top to bottom. The top bar offers quick link opportunities to some of their main sections including food, drink, arts/culture, music and more. There is a rolling slide show that features images from current stories. They have a google custom search option as well. There is so much information on the home page that it is necessary to scroll down almost three full lengths in order to see the entire site. According to the Philadelphia Weekly Media Kit, their readers fall mostly in the 35-44 year old age range, have earned a college degree and make between 50 and 75 thousand dollars a year. The website generates business via online advertising, print advertising, mobile advertising (including their i-phone application) classified advertising. Between all three publications they have a 500,000 weekly readership, 775,000 monthly webpage views, over 24,000 email subscribers, over 5,000 mobile subscribers, host events that regularly draw between 300 and 3,000 people, and have a street team that focuses on “guerilla marketing efforts.” About half way down the main page there is a “Like” the Philadelphia Weekly on facebook option, it includes the number of people who “like” the publication (4,452) and lists that it is a Facebook Social Plugin. 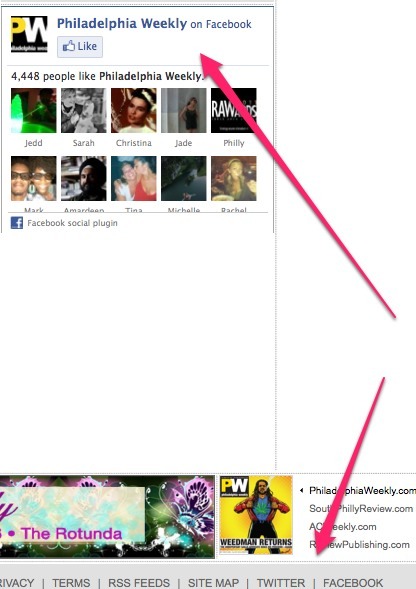 There is a link to follow on twitter at the bottom of the home page, it is just a grey link, not a twitter icon. The website is powered by Clickability.